"Silver bells, silver bells... it's Christmas time in the city. Ring-a-ling, hear them ring, soon it will be Christmas day. 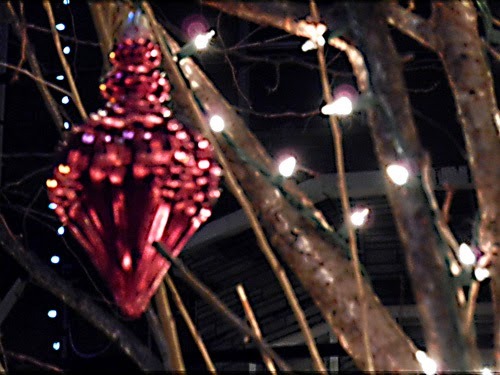 City sidewalks, busy sidewalks, dressed in holiday style, in the air there's a feeling of Christmas. Strings of street lights, even stop lights, blink a bright red and green, as the shoppers rush home with their treasures." ~ "Silver Bells"... lyrics by Jay Livingston and Ray Evans. And it's here in South Philly, a residential neighborhood without a shopper in sight, that Michael and I are being moved by the spirit of Christmas. We're standing on the 1600 block of South 13th Street, known in Philadelphia as The Miracle of South 13th Street, just off of Passyunk Avenue. Here are some photos so you can enjoy the lights, statues, and decorated windows on these row homes without "Jack Frost nipping at your nose." "I'm dreaming of a White Christmas... with every Christmas card I write... May your days be merry and bright... And may all your Christmases be white." ~"White Christmas"... lyrics by Irving Berlin. To hear Bing Crosby sing "White Christmas" go here and "Silver Bells" here. And for a fun crazy twist on "Jingle Bells" sent by Joey 'D' go here. Loved the beautiful lights! Great shots! Thank you, Joey D. for your fun contribution.